Rainy days are really here! 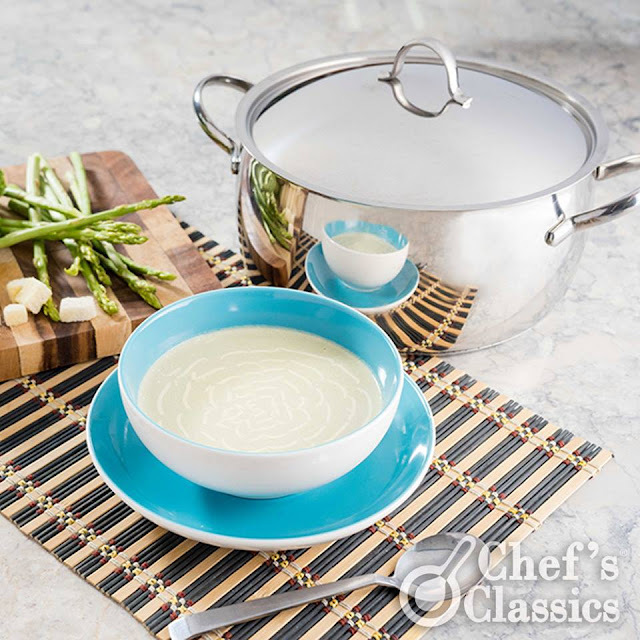 There's no denying to the pitter patter of the rain on your rooftop, and a serving of Cream of Asparagus and Broccoli Soup is just right for the chilly days. 1. Using the Chef's Classics Red Carnation preheated saute pan, cook onion, garlic, chorizo, bacon, asparagus and broccoli until tender. Season it with salt and pepper. 2. Transfer the sauteed vegetables in a blender and mix. Gradually pour about 2 cups of milk. Blend again. 3. Pour the asparagus mixture to the Chef's Classics Red Carnation preheated sauce pot. Add cream and milk. Season with salt, pepper and a dash of nutmeg to taste. 4. Make it more special by adding croutons and bacon bits when serving. Enjoy!